Sirius Signal and Weems & Plath were honored to travel to Canada and receive the CASBA Environmental Product of the Year Award. We’ve been able to make such an impact in the #boating industry because of the loyalty and commitment of our customers to take the “No Flare Pledge” and to purchase a safe, environmentally-conscious alternative to traditional flares. This year’s selection were chosen from hundreds of products introduced or significantly updated since the beginning of 015. The honorees were selected for their innovation, their impact on the industry, creativity and more. It’s always been a bit of a Catch-22: the best way to signal for help after dark is by igniting a very hot flame—thereby immediately increasing the danger in an already fraught situation. Recently a number of different electronic “flares” have been created to get around this problem, but it was up to Sirius Signal to create an electronic device capable of meeting the requirements of the U.S. Coast Guard. The SOS Distress Light pairs a powerful LED with an omnidirectional lens to create a light signal that is visible for 10 or so miles and capable of lasting six or more hours. Waterproof and submersible, the SOS Distress Light also never expires—in stark contrast to the conventional pyrotechnic devices it replaces. 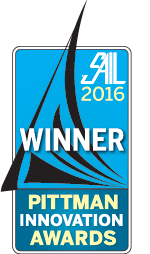 VIRGINIA KEY, Fla. – The National Marine Manufacturers Association (NMMA) and Boating Writers International (BWI) announced today winners of the 2016 Progressive Insurance Miami International Boat Show Innovation Awards, presented during the annual Industry Breakfast at the Miami Beach Convention Center. This year’s program evaluated 77 products across 31 categories featuring an outstanding pool of entries. The judges ultimately selected 17 winners in 16 categories and three honorable mentions for a total of 20 honorees. The Innovation Awards judging committee is comprised of BWI members who perform product testing throughout the year and have specific expertise in marine products and equipment. The committee is co-chaired by Zuzana Prochazka and Alan Wendt. Prochazka is a boating and travel journalist and photographer who has been in the marine industry for two decades. She regularly writes for a dozen magazines including SEA, SAIL, Bluewater Sailing andSouthern Boating. Wendt is president of Boating Writers International and has served as a judge for more than 15 years. Frank Lanier: An author and award-winning journalist, his articles on seamanship, marine equipment reviews and vessel maintenance appear regularly in numerous marine publications worldwide. Marilyn Mower: Past editor of ShowBoats International, Southern Boating and the Marine Business Journal magazines and currents Books Editor for Boat International Media producing annual editions of The Superyachts, Megayachts: Concept, Design, Construction and Refit. Lenny Rudow: Senior Editor for Dominion Marine Media and Electronics Editor for BoatUS Magazine, and Boating Editor for Texas Fish & Game. Lawrence Husick: Patent attorney, entrepreneur, freelance writer for several boating publications, and life-long cruising sailor. He has worked with innovators in the marine industry as both counsel and consultant, and frequently speaks to audiences about new technologies afloat. Nigel Calder: Well-known industry author and Technical Editor or an Associate Editor of PassageMaker, Professional Boatbuilder, Sail, Ocean Navigator and Yachting Monthly magazines and a freelance consultant on marine energy issues. Gary Reich: Editor at large for Chesapeake Bay Magazine and regularly published in periodicals such as Soundings, PassageMaker, Chesapeake Bay, and Lakeland Boating magazines, and online at boats.com and boattrader.com. Innovation Awards recognize exceptionally innovative new consumer marine products, and will be on display throughout the show, Feb. 11-15, at Miami Marine Stadium Park and Basin. For more information, visit www.nmma.org.